Reduce the total number of pages on the Lane website by 5% (from 5768 to 5475). 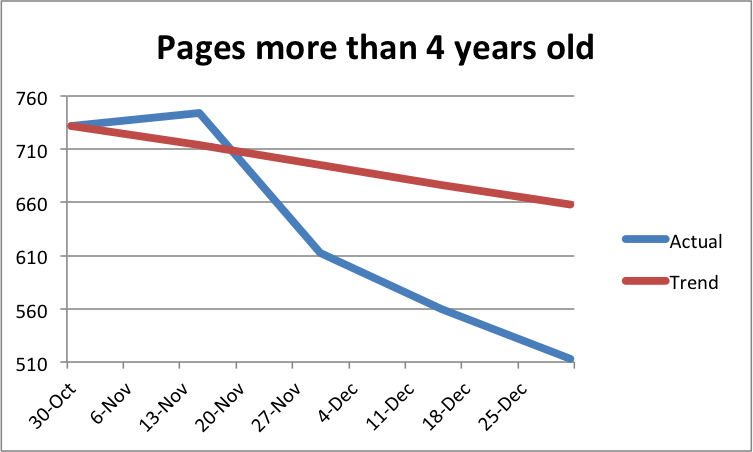 Reduce the average character count of our pages by 10.5%, from 4803 to 4300.
improve the average age of our pages by 6 months, from roughly 24 months old to 18 months old. 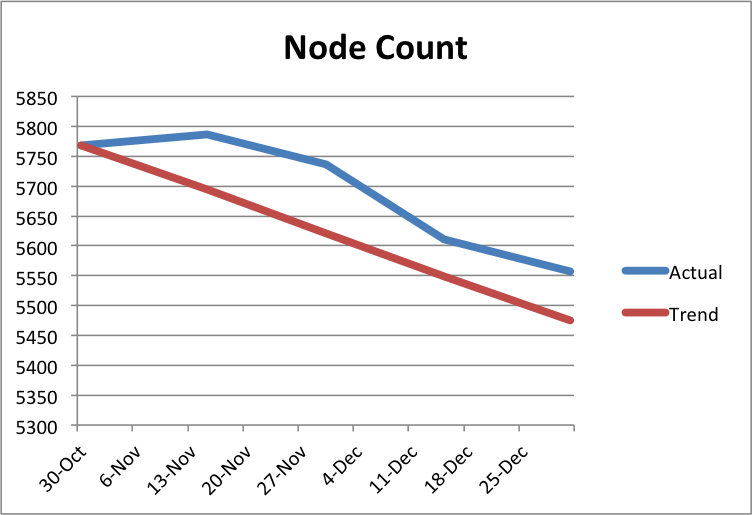 We were able to make some progress eliminating nodes even in December, but things slowed down. Part of that is because with so many people on vacation around the holidays, it’s difficult to get permission to delete a page. We’d been shooting for a 5% reduction, but we were only able to get 3.5%. As mentioned in the previous goals post, it turns out that many of these really long nodes are pages that are really hard to reduce, like board meeting minutes or transcripts of in-service addresses. I reviewed almost every page and removed a lot of really bad markup: things that we should have removed when initially porting pages to Drupal, boldfaced text that should have been headers, HR tags used improperly, and so very, very many &nbsp; characters. We’ll tackle some of those in a future post. We’d been looking to make a 20% improvement, but we only managed 10.8%. Average length was really depressing for me, especially as I’d update statistics after working on these goals for a few hours. I might spend two hours meticulously working my way through the list of really long nodes, since they’d help us meet this goal the most. 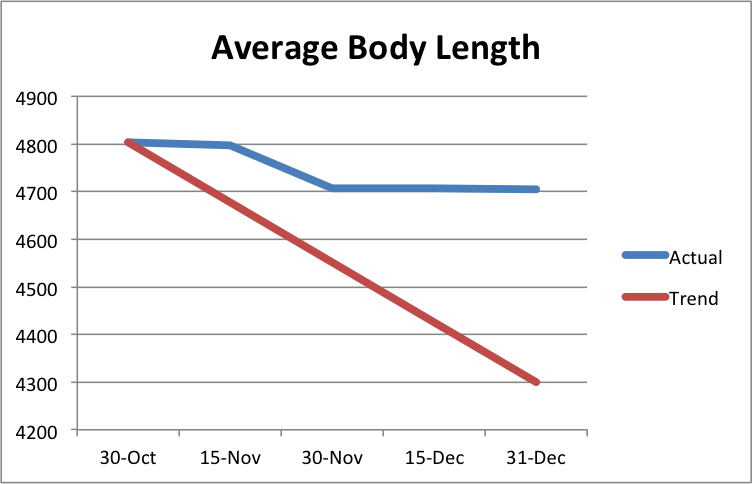 And I might see a visible improvement on the body length graph. But then I’d work on eliminating some nodes, and inevitably those nodes would be really short, meaning our average body length would go right back up. Still, we made some gains early on, and the site as a whole is improved. 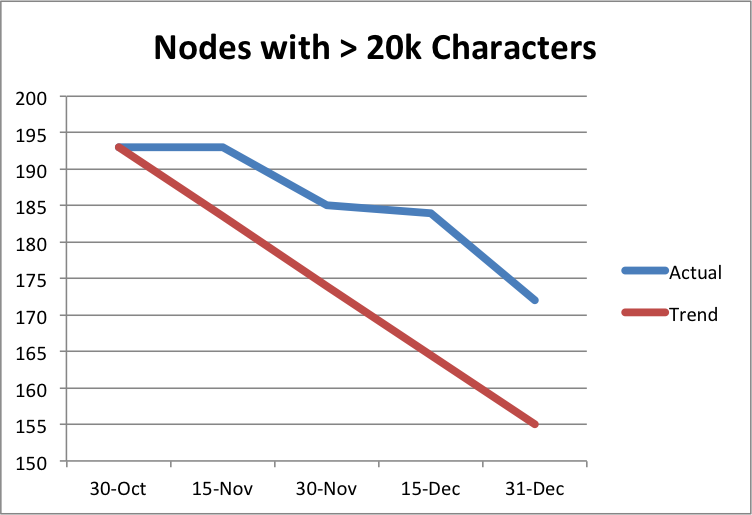 We’d been shooting for a 10.5% reduction, but we only made a depressing 2% improvement – about 100 characters. 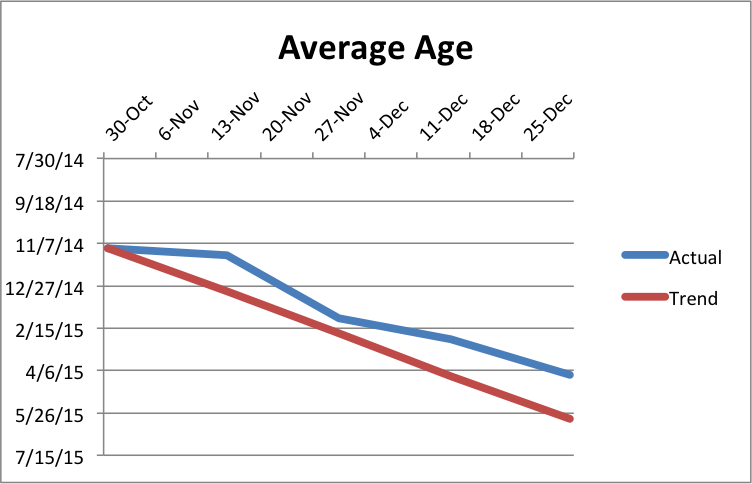 We probably made the most progress on this goal, but our failure to make progress early in November really hurt us. Over the two months we tried to meet our goals, pages got about four months newer. We tried to meet this goal primarily by updating our oldest pages. We substantially reduced our really old pages. And while it’s great we made that progress, since we hate ROT, it just wasn’t enough for us to meet our goal. We still have lots of tasks queued up in Basecamp for us to do related to content, that we just didn’t have time to get to as part of this challenge including reworking some tables that are used improperly, removing even more HR’s, fixing some pages that are using redundant text blocks, eliminating duplicated pages, adding headers, removing improper use of the • character (people use it for bullets, but they should be using the bullet tool), and figuring out what to do with pages where people wrote “check back for content soon” several years ago. So we expect to make more progress in the coming months. This entry was posted in Drupal and tagged Drupal by Kyle Schmidt. Bookmark the permalink.